You've arrived at Angela Sergio Cleary Part 3. If you would like to go to Part 1, click here... or here for Part 2 to read the beginning pages of her story/interview. Welcome to Angela Sergio Cleary - the third and final part of her interview. I hope you have had fun learning who Angela is. I enjoyed sharing this interview with you because I could tell that she enjoys sharing with us. After you finish, check out the rest of the interviews using the link at the end of the page. Enjoy Part 3 of the interview. Ciao! Question 4: Your husband seems to be a great source of support for you. Do you have children or plan to have a family? Yes, my husband has been quite supportive and no, we don’t have children and I don’t plan to have any. I am taking Tysabri which is a medicine that has many risks and that we don’t know the long term side effects and, at the moment, I am focusing on taking care of myself and on trying to stop the progression of the disease. 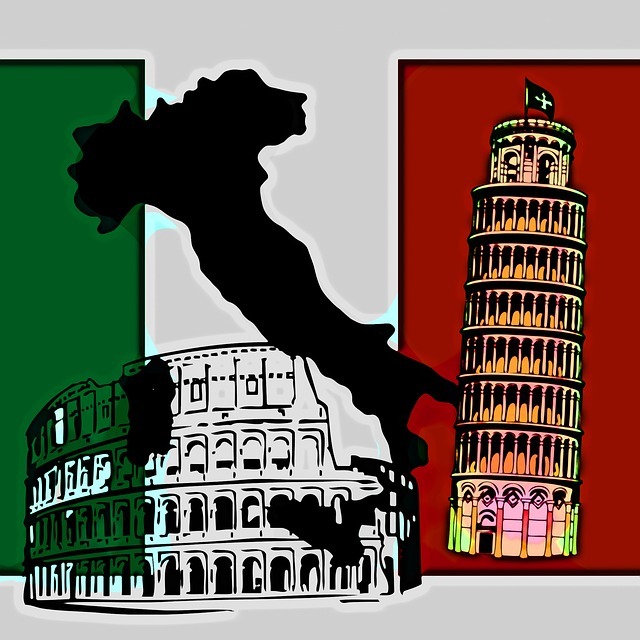 Question 5: How have your family and friends in Italy taken the news of your MS? Most of them were shocked and they didn’t know what to think and what to say. I was known by everyone as a very healthy person that rarely got sick and that was able to deal with certain pains (mainly menstrual cramps) in a very strong way and without the use of medications. It took everyone by surprise even if we were all aware about this disease. In my country we have more than 57,000 people dealing with MS and while I knew about it, no one was prepared to learn that I was going to be one of them. Question 6: What kinds of things do you do for fun? Has having MS made any changes in the way you do things? Or have you been able to continue doing what you love? One of my greatest passions is traveling and getting to know this country. One of my dreams is to see all the 50 states and I would love to show my husband all the regions of Italy. On a smaller note, I enjoy cooking (and I do it every day) gardening, interior design, scrapbooking, writing, taking pictures, walking (I used to enjoy it more when it was easier!) and listening to music (even if I don’t do it as much as I would like because of my head pain). I enjoy small things and I never mind the normal daily things in life. I take everything as a gift so things like doing laundry and cleaning my house are just as precious to me. Question 7: Have you ever gone back or plan to travel to the place you were born? What do you miss most about Italy? Yes, I do go back to Italy. While it used to be more often in the beginning, now it is usually once a year if all goes well. I have been very lucky these past two years because I was able to go back even if my MS was very active. Both times my MS took a break and I am starting to wonder if Italy is my cure…! The things that I miss most about my country are my food, flowers like poppies, sunflowers and wisteria which are some of my favorites, the art, the lifestyle, the fashion, the nature, the animals and, of course, my friends! Question 8: What is the best piece of advice you can share with those who have multiple sclerosis? And is this something you wish you had known when you were diagnosed with MS? I would like to tell everyone to try to appreciate each and every moment that comes their way. MS has many surprises in store for us and we never know how we are going to feel a few minutes from now, so we have to take advantage of the good times when we can enjoy them! I wish that I would have known that this disease is extremely unpredictable and no one told me that things can change really quickly. I think that if I would have been aware of this, I wouldn’t have been so scared to find out that you can lose the ability to walk in only 3 days! I wish more MS patients would be told that this is possible and that while it can get worse, it can also get better! Question 9: We thank you so much, Angela, for your time and would like to leave this last question open for you to share anything else you'd like with our readers. Thank you for giving me the opportunity to be a part of this. I think it’s very important to share our experiences with others because it can help them to better deal with the struggles and the scary challenges that this disease can bring. It’s important to be honest and to open up with others and I think that is extremely important to share a message of hope and of compassion. I feel that people with MS can create and be part of a close community where we can help each other better deal with living with Multiple Sclerosis. Thank you very much and good wishes to all. Help support research to find a cure for Multiple Sclerosis!